I’d been looking forward to this race for a long time and it definitely didn’t let me down. Not only was I excited to race my first 15k distance (i.e. less pressure – no PRs to worry about), I had also rounded up a fun group of people to race with me (including my Dad and Step Mom!) and at the end I’d be served hot chocolate and fondue with all the fixings. Best. Race. Ever. The week leading up to this race was somewhat of a rough one for me. I had an absolutely amazing 17.5 mile long run the Sunday before which had included two segments of tempo intervals and I had finished at an 8:30 min/mile average. It was a great run but it also took me at least two full days to recover from it. Wednesday I had my tempo intervals which went really well (main set was two 20 min tempo segments with averages in the 7:30s!) but they also took some time to recover from. Come Sunday morning pre-race my legs were a bit heavy and I was regretting drinking champagne and wine (pre and post engagement photo session) and eating a big (however, extremely delicious) Italian meal at a local restaurant the night before. However, the excitement of the race was enough to negate all of that. 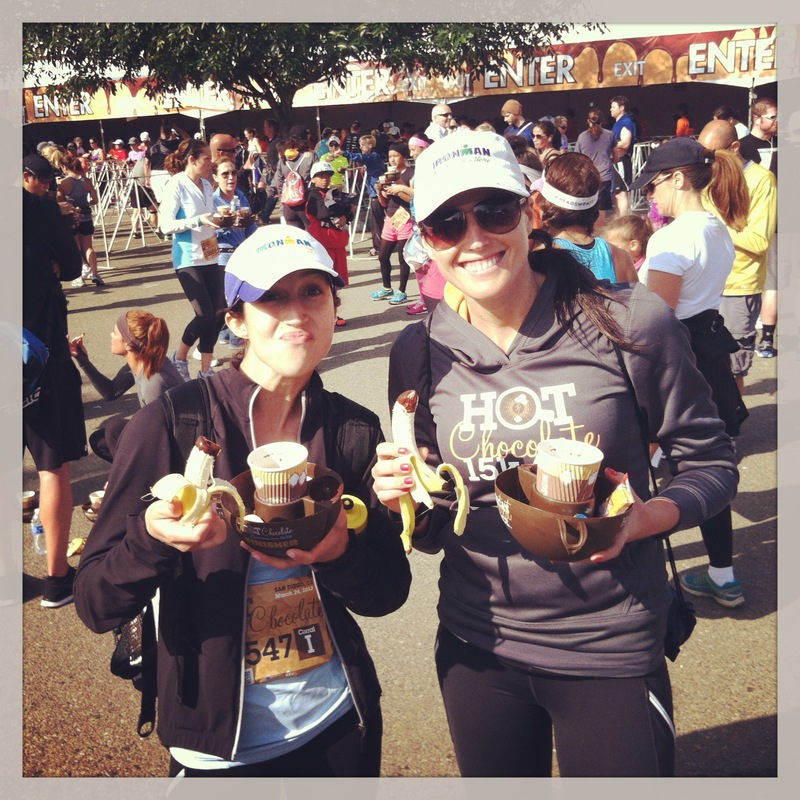 One of the best parts was that for the first time in over a year, I was running a race with my best friend Asia! 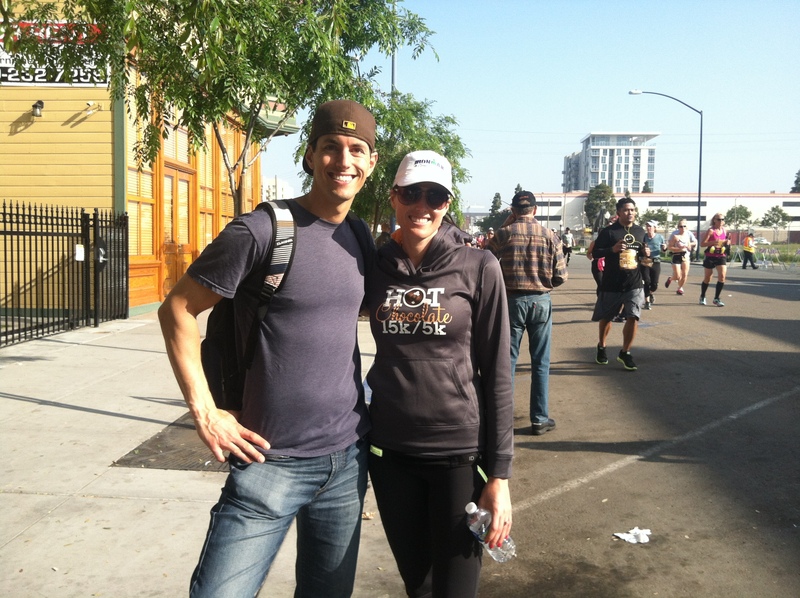 Mike came with us to be our cheer squad even though he wasn’t racing and after breezing into a free metered spot in the Gaslamp, we walked a few blocks to East Village to the start, past all the cars sitting in traffic waiting to pay for expensive lots. Once we arrived, we used the restroom (super short lines!) and attempted to corral the various people we were trying to meet up with. Luckily we all found each other for a few minutes before getting lost again when we went to gear check. 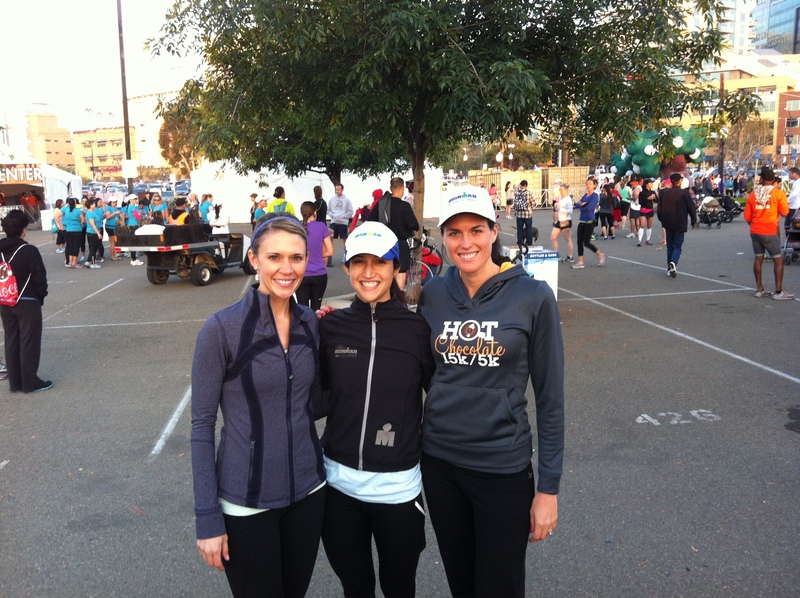 After a short warm-up run through the parking lot, we made our way to the front of the very first corral. The start line was literally on a hill which was great foreshadowing for what was to come. I had known that this course was hilly, but I hadn’t driven the course or every run any of the streets so I really had no idea of what was to come. I knew the first half was definitely more hilly than the second but that was it. Once the gun went off we shot out the gate. Since we were going uphill I wasn’t sure how fast to actually run so I just went based on feel. Well, it felt hard. 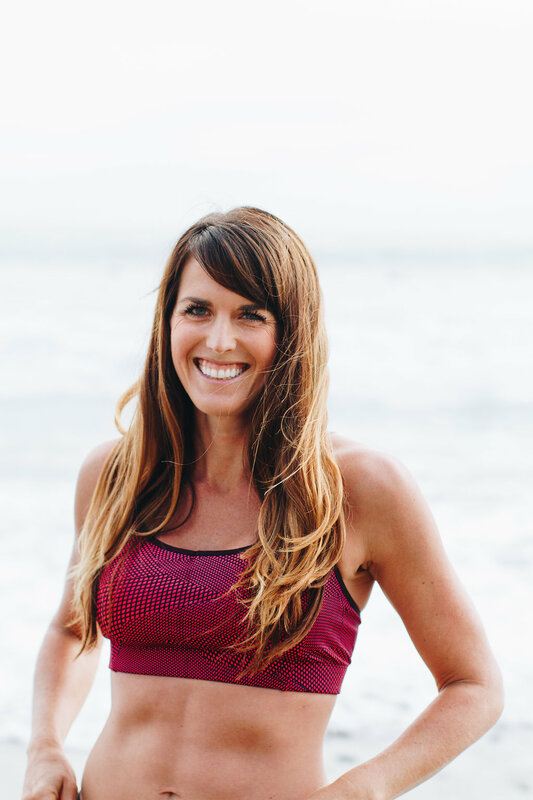 My legs weren’t fresh – I knew immediately I didn’t feel as great as the San Diego Half yet I knew I was racing a much tougher course. My mind wasn’t in the best place right off the bat which is never a good thing. Asia and I barely spoke for the first mile because we were breathing really hard. My watch ticked off the first mile – 7:53. Behind pace but certainly not bad considering the hill we were climbing. At some point we saw Mike cheering for us on the course which was a boost! Mile 2 included both inclines and declines which meant we able a slightly confidence boosting 7:36 min/mile, but from there on out it felt like we were nonstop climbing. I kept thinking to myself that this was a “soul crushing course.” I had no idea if I’d be able to achieve my goal of a 1:11 (7:38 min/miles) because at this point it was difficult to even stay in the 7s. Miles 3 & 4 – 8:00 and 8:21. I knew that at some point we had to go downhill after so much climbing. I just didn’t know when. Asia was right by my side and we were doing a good job of keeping each other motivated to keep going (mostly just knowing she was there with me kept me pushing hard – we could barely speak). I think somewhere during the 5th mile I got pretty excited because I knew I was over halfway done and I could survive the pain if I had to push hard. I guess that’s one of the reasons that tough training runs are so hard – during difficult moments in a race you can always go back to that memory of how bad it hurt during a training run and remind yourself that you can make it through the pain. Luckily mile 5 also had some downhill portions so we were able to get back to a 7:49 average. Mile 6 was probably one of the best because it had a very, very long decline that was quite steep. We were flying down it and finally could talk because we weren’t breathing so hard. There wasn’t a lot of course support or much to look at during this race but it almost didn’t matter because all your mind could focus on was keeping your body moving forward. A ray of hope that we could make up the time we lost going uphill came over me when my watch clicked off 7:27 for Mile 6. I told Asia our pace and then said that if we kept it up or went faster for the next 3 miles we could make it! I think she grunted in response. The beginning of Mile 7 was the remainder of the very wonderful downhill portion we’d been cruising down but at the bottom of the hill we turned a corner (where Mike was standing and cheering for us!) and immediately were greeted with a Goliath hill. In the back of my mind as we’d been cruising down that last decline I knew we hadn’t climbed our last hill but I was also hoping that there wouldn’t be too many soul crushers left. 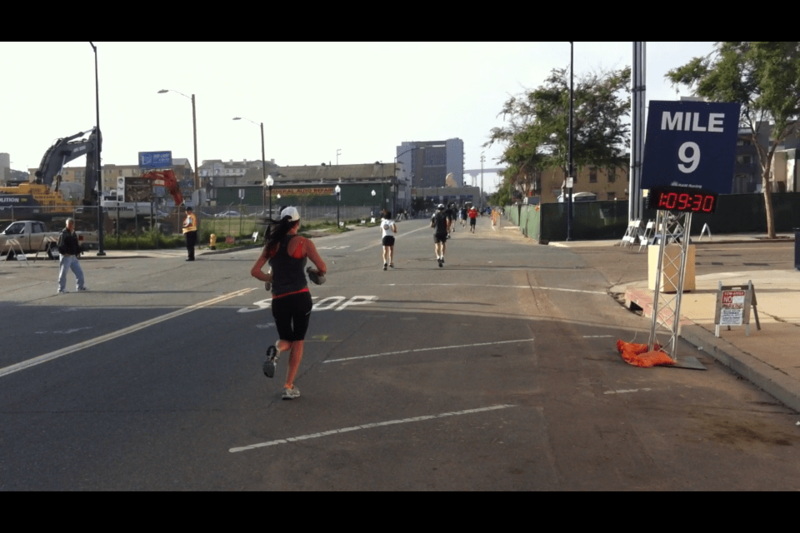 I mentally reminded myself that I was less than 15 minutes from the finish line and ran up the hill as fast as I could. At the top, Asia and I got separated as I dodged three slow people turning a corner and from then on out, I was running by myself. My watch clicked off mile 7 – 7:19. Mile 8 began with an incline but also included some lovely declines and as I caught my breath I was able to pull out a 7:30 min/mile. I was feeling good – I knew the finish line wasn’t far away and I knew I had a nice downhill to take me there. I dug deep and pushed hard – as I ran down some of the hills my pace was in the 5s and even on the flat I was cruising in the high 6s. Just as we re-entered downtown there was one last fairly steep yet very short incline and I just flew up it. Just before I saw Mike (he was standing near the mile 9 sign) my watch clicked off mile 9 at a 6:55 pace. I was close to my goal and I was so happy to see him – I was smiling ear to ear. I felt strong and good. The last 0.3 seemed very long, likely because it was finally mostly flat. I ran my heart out and averaged 6:41 for the last 0.42 according to my Garmin. I got passed by a couple of people who apparently had a lot of steam left in the tank, but I didn’t let it bother me as I jammed toward the finish line. Victory! 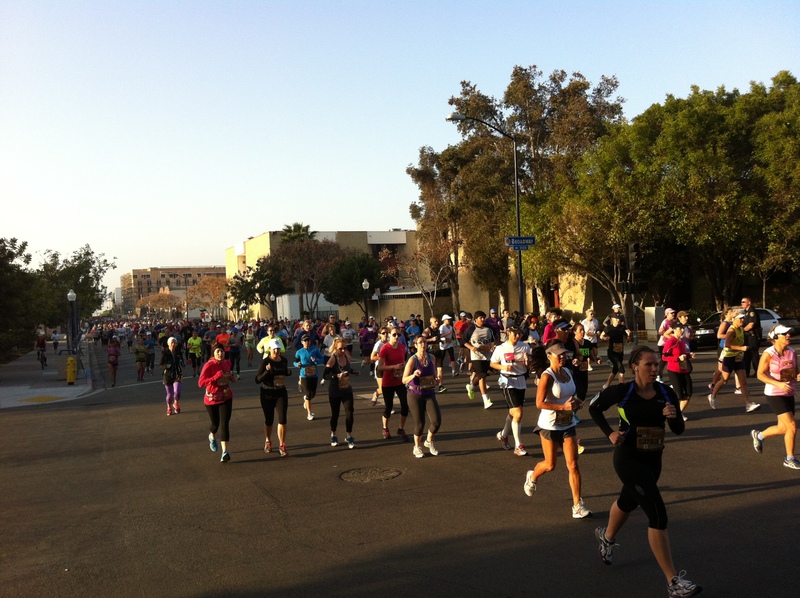 I ran 9.42 miles in 11:11:35, for an average pace of 7:36 on a soul-crushing course. This was actually a 5k PR – 3x over! I haven’t raced a 5k for a couple years but that’s still pretty awesome! 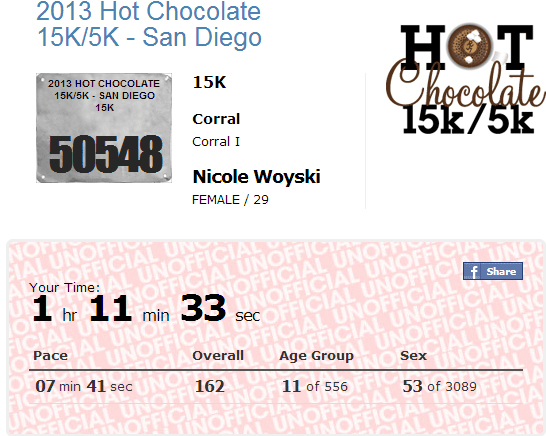 My official time was 1:11:33 and I was 11th in my age group out of 556! 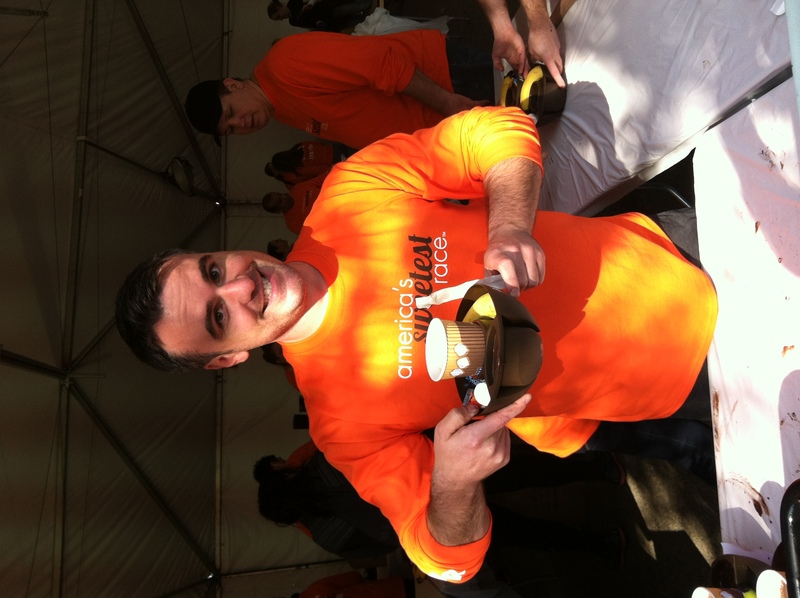 The 162nd person to finish out of over 12,000! Asia came in right behind me and I was so proud of her – I am really feeling great about our chances of qualifying for Boston together at Eugene. I can’t wait! We went back to the spot near mile 9 where Mike had been cheering us on earlier and cheered for the racers (some in really awesome costumes like a Hershey Kiss), including my co-worker Joanna and my Dad and Step Mom! After they finished we headed back for our much anticipated reward- hot chocolate and chocolate fondue!!! It was absolutely delicious and the perfect treat. This race was another confidence booster. My coach confirmed that I’m still a head of the game for my BQ at Eugene and that this race proved that I’ve gotten even faster in the last week. Each week I’m improving. I would have never thought that with 5 weeks to go til a race that I still had room to get even faster – but now I’ve proven that even just 5 weeks of focused training can make a difference. Here we go! 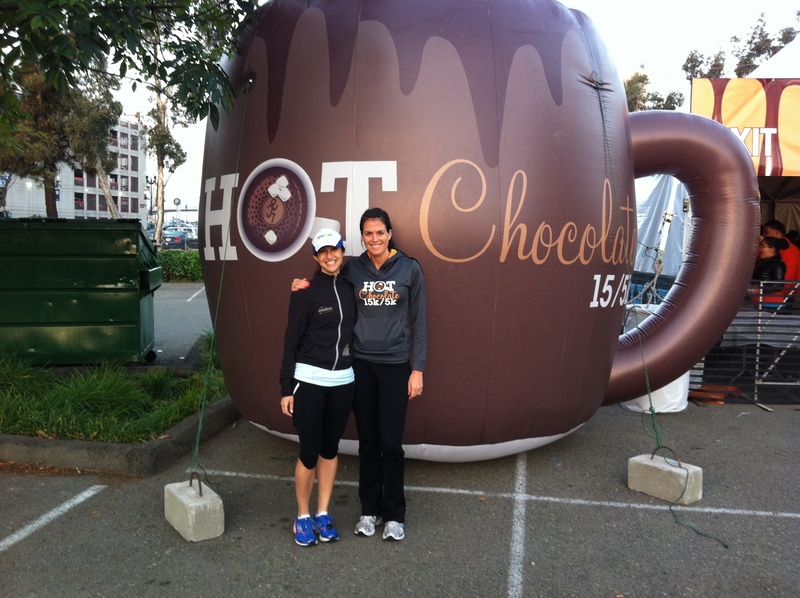 Have you ever run a Hot Chocolate 5k or 15k? What did you think!? Awesome race review! 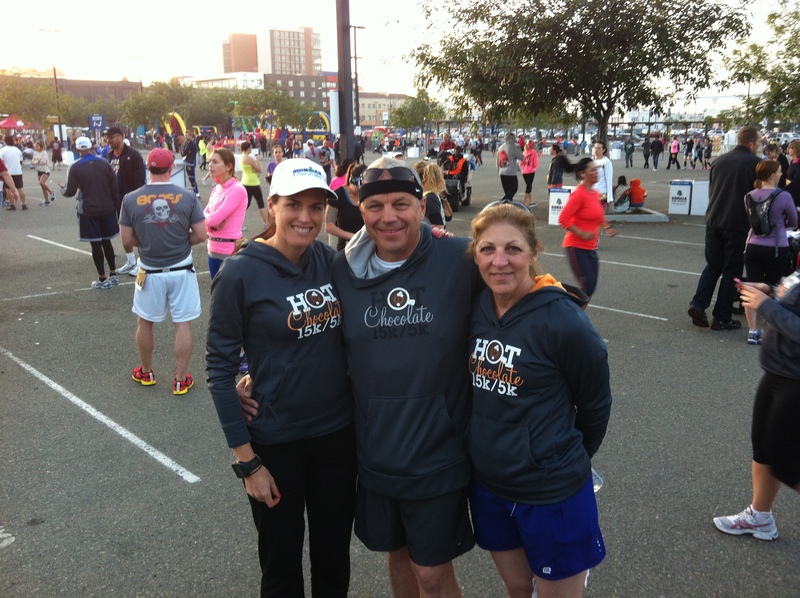 I think 9.3 miles on a challenging course is an excellent test of fitness for BQ-ing, way to go! Ran it on Sunday! I saw mike ! I ran my fastest 5k and 10k and my fastest mile ever on Sunday! It was a great race day! Hey I ran it on Sunday too! I had my greatest race ever! Pr on the 5 k and 10k time! I am absolutely doing one of these races when I can either travel or one comes to a city we move to 🙂 I want those hoodies I think that each time I see my friends in one, hehe race priorities! wow you did amazing! Bummed I missed you!